Drying vegetables is one of the oldest methods of food preservation. Because bacteria, mold and yeast need moisture to grow, dehydrated veggies remain fresh and do not spoil. They also become lighter and take up less room, making storing them more convenient. As long as they are stored in an airtight container in a dry, dark area they will not spoil. Most dehydrated vegetables can be stored for up to a year at 60 degrees Fahrenheit or six months at 80 degrees. 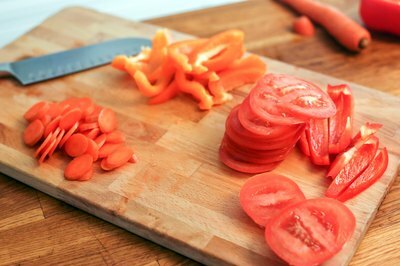 Vegetables need to be blanched before drying to stop the enzyme action responsible for ripening and spoilage. This means you need to clean, wash and chop the veggies into the desired size and then drop them into boiling water to blanch them. The Colorado State University recommends adding 1/4 teaspoon of citric acid (available in the canning aisle) to each quart of boiling water. 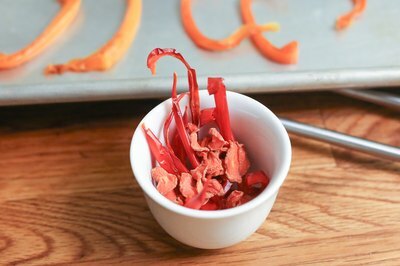 Citric acid works to prevent microbial action and helps preserve the color of the veggies. The amount of time needed to blanch the vegetables depends on the type of vegetable and the size of the pieces. It can range from 2 to 7 minutes. Blanch your veggies first, regardless of the drying method you choose. Many fruits can be safely dried by laying them out on trays in the sun, but most vegetables cannot because vegetables do not contain high amounts of acid. But, you can still use the sun to dehydrate vegetables by using solar drying. This typically means creating a solar box that is lined with aluminum foil and covered with a sheet of glass or plastic. The food trays are placed inside the solar dehydrator where they are subjected to higher heat and dehydrate before they can spoil. 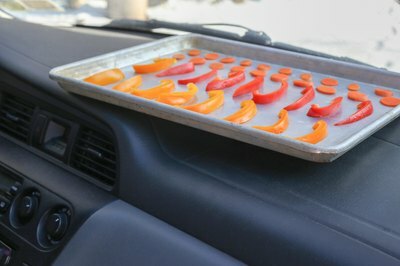 According to The Kitchn, an online cooking site, you can use your car for the same purpose by layering cut vegetables on a cookie sheet and placing it in the back window or on the dashboard to dry them. Your oven can be used as a dehydrator for drying your prepared veggies, but it does take monitoring. The temperature must be maintained at 140 degrees Fahrenheit and air must be circulated. If your oven does not have a circulating fan, prop the door open 3 to 6 inches and place a small fan near the door. 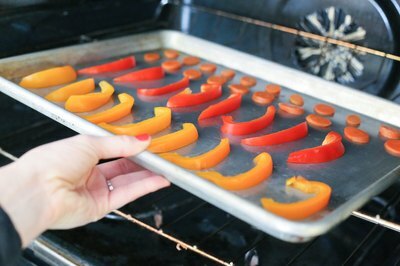 Place your prepared veggies on trays that are 3 to 4 inches shorter than the depth of the oven and clear the sides of the oven easily. This allows for air to circulate freely around your veggies. Use caution with this method if you have pets or small children in your home. Food dehydrators are designed to provide the ideal environment for drying fruits and veggies. 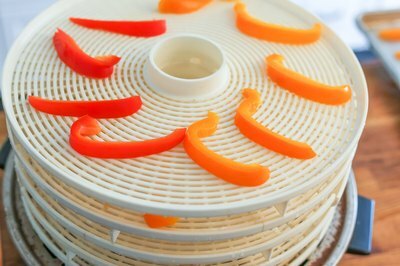 Layer the prepared veggie pieces on the tray of the dehydrator and set the temperature to 140 degrees Fahrenheit. Temperatures above 140 degrees will cook or harden the outside of the veggies before the inside has time to dry. Lower temperatures may allow the food to spoil before drying. Drying time ranges from 6 to 14 hours, depending on the vegetable and the dehydrator.